I have yet to meet the person who actually likes taking taxis. In any country you are left with a feeling that somehow you are being ripped off. In Britain you need to grasp the difference between the different sorts of cab - London's Black Cabs (and similar taxis in other large towns), minicabs, and non metered taxis. Remember the universal rule to ask if the taxi is metered, and if it is not, to ask the price before you start the journey. Taxis are never cheap, but they are convenient. Black cabs can be hailed if their "for hire " light is illuminated. London cabbies have to pass a very stiff exam on their knowledge of the streets of London before they are given a cab licence (you will often see these putative taxi drivers circling the streets on London on motor cycles with a clipboard of maps, boning up on routes). 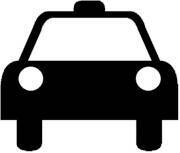 Therefore your cab driver will not get lost, and will know where to take you. Fares are higher after midnight and at weekends. What to tip is always a difficult question, 10% or more should avoid verbal abuse from the driver. And remember that not all London Black Cabs are now black - they can be any colour, and can be plastered in advertising, however their distinctive shape remains. Often in the provinces you will find that no taxis have meters. Always ask what the charge is before you start your journey and how far away the destination is.